"Midsummer Dreams" images. I think this set is my fav. 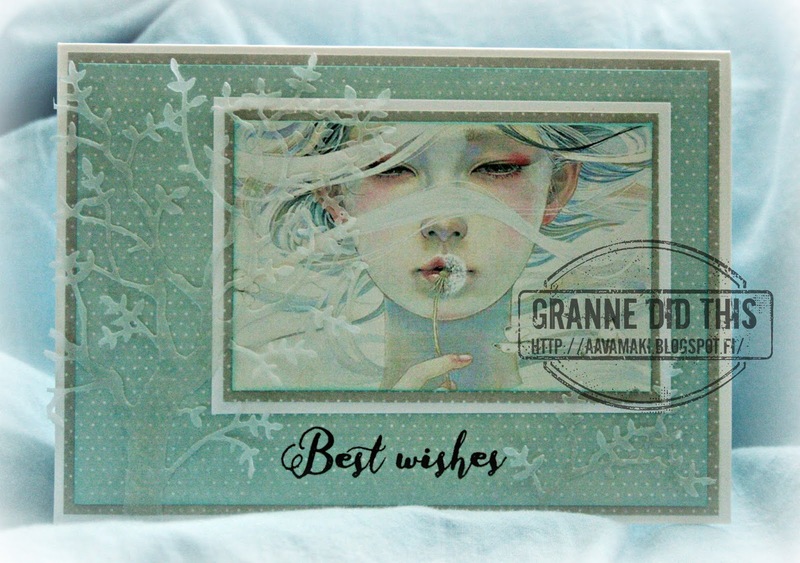 It is a very beautiful image on your lovely card. Thank you for sharing with us at Try it on Tuesdays. Wow!!! This is exquisite!! Stunning image and beautiful card! Thanks for sharing this with us at Penny's Paper-Crafty Challenges! Niin kauniit materiaalit ja värit ihanasti aseteltuna! Simply amazing . Such a stunning card! We are just happy to see it linked to Try It On Tuesday and Moo Mania & More! Thank you very much for joining us! What an amazing image! She's beautiful and so delicately coloured. Lovely. So gorgeous! Thanks for joining in at CRAFT Challenge. Kaunis. Kiva kun tulit mukaan Try it on Tuesday haasteeseen. That looks really gorgeous and very romantic. I love this lovely card very much. Beautiful card. Love the colour scheme. What a gorgeous image.